Dhulikhel is an ancient town located at 30 km east of Kathmandu along the Kathmandu - Kodari or Arniko Highway (way to Tibet) is famous for its scenic beauty and tradition a lovely place. From this place, one can have a complete panoramic view of the snowy ranges of Annapurna range, Langtang, Choba Bhamre, Gaurishanker, Number Karyolung etc. From Dhulikhel one has a good view of the sunrise. Namo Buddha: Namo Buddha is situated on a hill above Panauti and requires either drive or good hike, walk is recommended to visit this place. There is an amazing story concerning Buddha being commemorated by an ancient stone slab and a stupa with the all seeing eyes of Lord Buddha. Navo Buddha is an ideal place for in meditation. Monsoon i.e. May, June & July are not recommended. About two and a half hours north of Dhulikhel on foot, the stupa rest on a red-earth ledge near the tops of jungle ridge. During February-March pilgrimage season, Tibetans and Bhotias arrive by the vanload to circumnavigate it. Among the houses surrounding the stupa is a dinky Tamang 'Gompa' when you can enter. A trail leads up to a bigger Tibetan Gompa on top of the prayer flag festooned ridge behind and in one of the outbuildings is preserved a famous stone relief sculpture depicting the legend of Namo Buddha. According to the fable Buddha, in one of his previous lives as a hunter, encountered a starving tigress and her cubs here, and moved by compassion, offered his own flesh to her, a sacrifice that helped pave the way for his eventual rebirth as the historical Buddha. The stupa is supposed to contain the hunter's bones and hair. 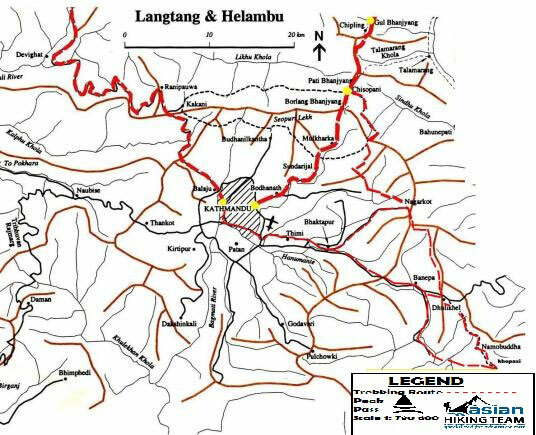 Palanchwok Bhagawati: Palanchowk Bhagwati is situated over the hill overlooking the valley of Panchkhal and 40 km northeast of the Kathmandu city. This temple of Palanchowk Bhagwati is said to have been constructed during the reign of King Man Dev. The temple houses a 3 foot long beautiful artistic idol of Goddess Bhagwati carved in a black stone. The penalty is wedged between the Punyamata and Roshi streams. Panauti forms the shape of a triangle with a serpent (Naga) idol standing at each of its three corners to protect from floods. The pride of this place goes to the massive, three-tired Indreshwor Mahadev. Some authorities believe this to be the original structure that was raised here in 1294 AD, which would make it the oldest surviving Nepal. The shrine area at the sacred confluence called the Khware', is one of those tranquil spots that can way lay a dreamer for hours. The large 'battle', a favorite hangout for the local pensioners, the collective range of fresco depicting scenes from Hindu and some Buddhist mythology. Vishnu in cosmic deep, Rama killing the ten-headed demon-king Ravana and even Krishna being chased up a tree by a pack of naked Gopis (milkmaids). On the opposite back stands the recently restored 17th century Brahmayani Mandir. Highlight of trip: Short and easy hiking, nearby kathmandu, Sunrise and sunset view, hidden valley view, Green mountain, Paronamic view, Cultural people, monastery, Hinduism and buddhism. Day 01: Drive to Dhulikhel, 2 hours and hiking to Navo Bouddha, 3 hours Hiking, Overnight in Hotel/Monastery. Day 02: Hiking to Khopasi, 3/4 hours explore the rural village, Overnight in Hotel. Day 03: Hike to Panauti and drive to Kathmandu, Overnight in Hotel. Day 01: Drive to Dhulikhel, 2 hours and hiking to Navo Bouddha 3 hours, overnight in Hotel/Monastery. Kathamndu travel to Dhulikhel 2 hours drive by tourist coach then we start hiking tour to Navo Bouddha 3 hours. Explore the monasteries and the temple, join the Puja by Monks, there are 250 monks and nonks. overnight in Hotel or Monastery. After breakfast we start our hiking tour to Khopasi 3/4 hours, take lunch visit local village and the market overnight in Khopani hotel or home stay. Day 03: Hike to Panauti and drive to Kathmandu. 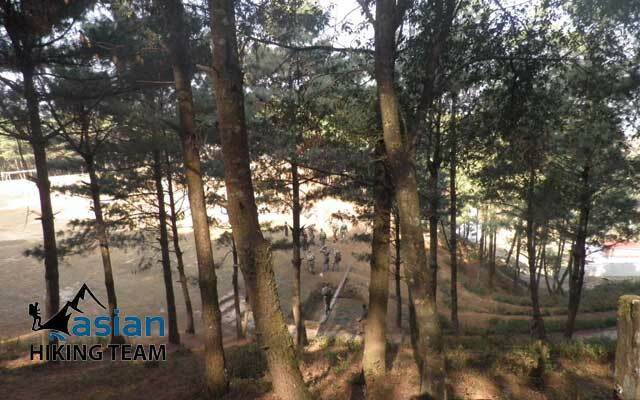 We continues day hiking to Panauti 2 hours and our tourist coach will be ready to bring you in Kathmandu 2 hours drives, transfer to hotel, end our Dhulikhel hiking trip.